Thank you for your support for CJGQ's products. CJGQ is committed to providing customers with the highest quality products and services. 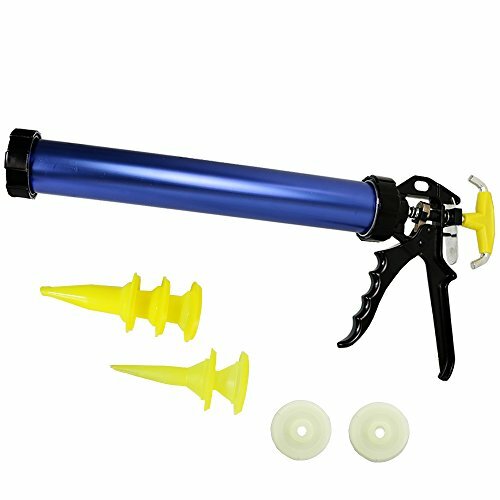 This is a Professional grade manually operated caulking gun to dispenses a wide variety of sausage pack/sealants/adhesives and other caulking.It is designed work with 20-Ounce Sausage / 10.3-Ounce Cartridge / 20-Ounce Bulk. able to slide along the length of the gun below the cartridge holder, is engaged and disengaged using the trigger. In addition,the thumb activated instant pressure release,can cut waste. - Unscrew the handle cover.- Push the plunger release button,pull the center pusher to the end. - Put sausage pack/sealants/adhesives/the soft-mounted rubber into the aluminum barrel. - Tighten the handle cover. - Unscrew the front cover,install special nuzzle. - Press the trigger back and forth to extrude glue. If you have any questions about this product by CJGQ, contact us by completing and submitting the form below. If you are looking for a specif part number, please include it with your message. Advance Equipment K12 Knock Down Knife, 12"